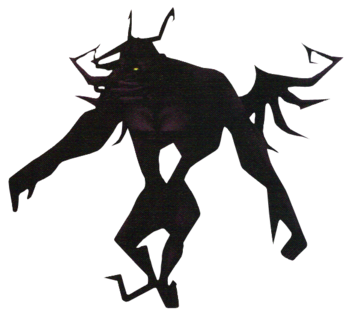 The Dark Follower is a Pureblood Heartless that appears in Kingdom Hearts 358/2 Days. It is encountered at Beast's Castle. Like the Darkside, the Dark Follower can summon Shadows, but unlike the Darkside, the Shadows that are summoned are purple, instead of the usual black. A Dark Follower is a massive, muscular, humanoid Heartless with dark purple skin. Its legs are rather short and its feet are very thin and curl upward. Its arms are rather long, and is has two relatively small, twisted wings on its back. There is a large, heart-shaped hole in the Heartless's chest. Its head is covered in dozens of twisted, dark purple tentacles. Only its small, glowing yellow eyes are visible. The Dark Follower's name is a clear reference to its dark color and its ability to attack using darkness. The latter part of its name could be a reference to the fact that it appears after a battle with other Heartless. "Follower" could also be a reference to the purple Shadow "followers" the Heartless summons. Shadow Summon: punches the ground, causing a dark pool and mild shockwave to form. This attack summons a small number of Shadows. Energy Rain: scoops up an orb of darkness, which splits into many smaller orbs that rain from the sky. Dark Missiles: creates a dark force in the heart-shaped hole in its body, which fires homing dark missiles. These can be dodged by standing behind the massive Heartless, or reflected back at the Dark Follower for major damage. At the start of the battle, immediately Lock-On to either one of its hands. Do not hesitate to attack, but be mindful of its own moveset. It can send its fist to sink into a pool of darkness, calling Shadows to emerge. Although the smaller enemies will attack with their claws, they deal minor damage; ignore them and focus on the Dark Follower, attacking its head, while still in reach, to deal major damage. The Shadows remain after the attack is finished, and they will drop much-needed HP Balls upon defeat. It is recommended let Xaldin deal with the Shadows while Roxas continues to damage the Dark Follower. Once the Shadows are destroyed, Xaldin will aid Roxas. The second attack the Dark Follower can perform brings its fist down upon Roxas with a shockwave. Get as far away from it as possible—use air slide to avoid it—or suffer major damage as the shockwave makes contact. It is also possible to jump over the shockwave with the right timing. This attack is nil-based, so having Nothing to Fear equipped will prevent Roxas from taking damage. The third attack involves it kneeling down and firing homing energy balls from its chest. The only way to avoid this attack is to use Block. Occasionally, the energy balls will be reflected back to the Dark Follower, damaging it. When an orb of dark energy rests in the Dark Follower's palm, prepare to dodge the energy that rains down from above. Bring as many healing items as possible into this battle. Utilize the Limit Break, and also make sure to equip Thunder, Fire, and Cure magic. By locking on to the head and using a cast of Thunder the Dark Follower will take major damage.